Whether you’ve got Rapunzel-length locks or a pixie crop, everyone wants healthy-looking hair, with tresses that are shiny and strong, not dull and weak. There are certain things we know will boost our hair health, like applying a conditioning mask every once in a while, and avoiding too much heat styling, but did you know there are some ways we could be damaging our hair without even knowing it? 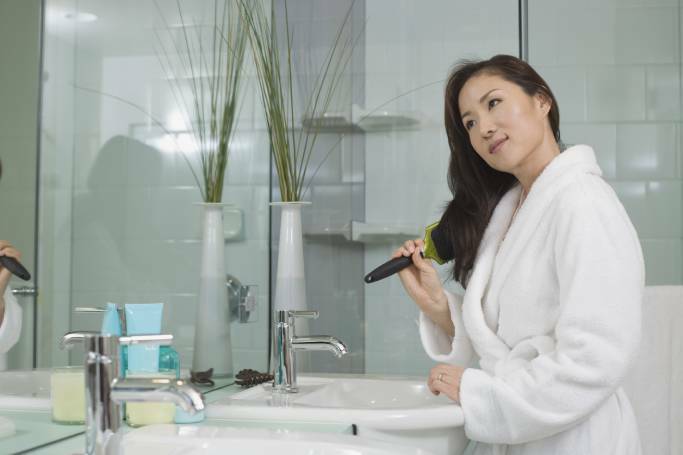 According to experts, there are seven mistakes people commonly make when it comes to hair care, from washing and drying to brushing and styling. On a blustery day, when you want to stop your hair flying all over the place, pulling it into a ponytail is a sensible option, but if you tie it too tight, you could be putting so much pressure on your follicles that it leads to ‘traction alopecia’. “This may lead to permanent hair loss if done repeatedly over a long period of time,” warns Anabel Kingsley, trichologist at Philip Kingsley. So don’t scrape your locks back severely, or you might end up with a receding hairline. While we’re not suggesting the fabled 100 strokes per day, we could all do to brush our hair a bit more, says Viviscal and celebrity stylist Neil Moodie: “Hair has a life span of approximately seven years and, on average, we lose around 120 hairs a day to make way for new ones to grow. If you don’t brush your hair, these hairs won’t loosen out. If you’re a regular swimmer, it’s important to minimise damage to your hair. “Chlorinated and salt water can be drying on your hair, especially African-Caribbean hair as it tends to be more porous,” says Kingsley, which is why you should also wear a swimming cap. Frequently shampooing your hair is essential for hair health and beneficial for hair growth. “Your hair, just like any other part of your body, does not clean itself,” says Kingsley, busting the myth that if you stop washing your hair it becomes self-cleaning. So next time you lather up, use your fingertips to gently massage your scalp, which also helps to exfoliate and keep your scalp healthy. “It’s OK to brush your hair when it’s wet, but as wet hair is naturally weaker than dry hair, it’s important to be gentle,” Kingsley says, especially if your hair is tangled. As for the brush, it should have flexible plastic prongs with rounded ends as bristles can damage the outer cuticle of hair strands. Towel drying may seem like the more gentle approach compared to blow-drying, but that’s not always the case. “Forcefully drying your hair with a towel results in frizz and tangled hair, as well as breakages,” says Moodie. As we now know, wet hair is weaker, so if you go to bed with soaking locks, they’re even more susceptible to damage. “Avoid going to bed with wet hair,” Moodie says, “and I always recommend a silk pillow as it causes less friction than cotton.